The face of the workforce is definitely changing and the younger generations are taking over! Aside from Millennials, who are expected to account for 35% of the global workforce by 2020, Generation Z has also started to enter the workforce. It is, therefore, important for today’s companies to recognize how these young workers can impact their growth and success. Millennials and Gen Zs share various common traits and wants, including competitiveness and the desire for financial success. However, they also have differences that business owners or employers like you should take note of. Let’s discuss some of them. Millennials are most likely children of optimistic Baby Boomers. This makes them more motivated and idealistic workers compared to Gen Zs. They value rewards and feedback and expect opportunities for growth. With their high hopes for a promotion, more Millennials are now taking on leadership or managerial roles. Whether as regular employees or managers, it is certain that Millennials have higher demands for company culture and core values. Gen Z employees, on the other hand, tend to be more attracted to work with great paycheck. For them, security, stability, and money are more important than “friendly company culture.” This is possibly because they are aware of the recession and financial woes their Gen X parents might have experienced during their time. While they are independent thinkers, Millennials are more collaborative and teamwork-focused than the younger generation. Gen Zs are generally more competitive and independent. They prefer to manage their own projects than work with a team and be alone in their own workspace. There are also differences in how both generations embrace their positions and welcome changing roles. Millennials, who are commonly tagged as the entitled generation, seem to be impatient. They want immediate results and crave change and movement in their role. If Millennials can easily get distracted, Gen Zs are better multi-taskers. They are task-oriented and are willing to perform multiple roles within the company. Millennials and Gen Zs have different perspectives on the impact of education on their employment. Millennials are more critical about the merits of education. Although according to research, most millennials with full-time jobs agree that their schooling prepared them well for work. They also expect to land a job immediately after graduating college. For Gen Zs, however, formal education isn’t a priority. They prefer to explore other options and enter the workforce early. They have that entrepreneurial spirit more than Millennials. In fact, one study revealed that 72% of high school students say that they want to start their own business someday. As individuals who value their education and budding entrepreneurs, we can say that both Millennials and Gen Zs make great employees. In this digital age, Millennials are considered digital pioneers, while Gen Zs are digital natives. While both generations are knowledgeable with various online tools and platforms, Gen Zs are more technically-savvy than Millennials. They would expect to get information with just a simple click or press of the button. 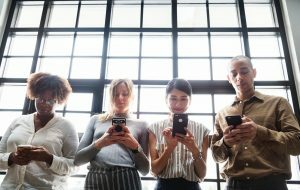 When it comes to communicating with colleagues, Millennials rely more on instant messaging and other digital communication tools. More Gen Zs, on the other hand, prefer face to face communication over online tools according to a study. There’s no doubt that generation shifts transform the workforce climate. Despite their differences, Millennials and Gen Z workers have something new and promising to offer the companies they work for. Their qualities, background, knowledge, and skills make them valuable assets. With these young generations on board, you can drive business growth.